Part of the busy Central Street, Rainbird Art & Framing is one of the best frame shops in the city, especially if you are on a budget. You can also source local art and mirrors from here. Known for its endless furniture shops, Central Street is a haven for budget shoppers looking to steal a deal. 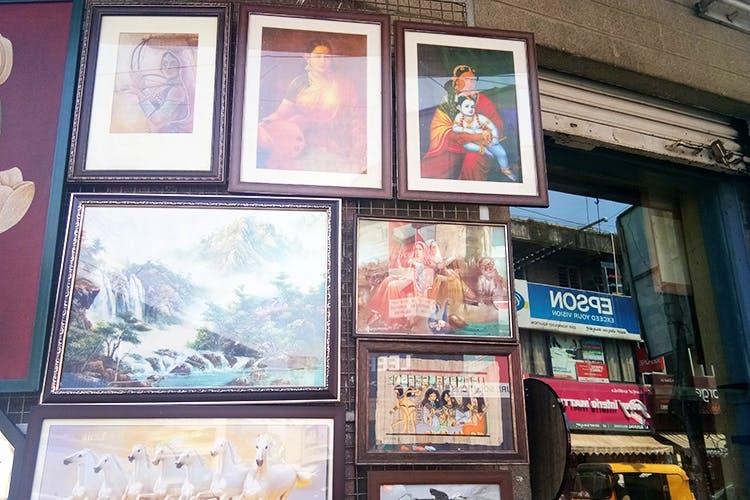 The bustling street also includes several frame shops and from our endless trips there, you can count on us to have a favourite. Standing right at the junction where Infantry Road meets Central Street, Rainbird is housed in a lovely, stone building. Enter and you’ll see workmen studiously working on frames of all sizes. Prices begin at about INR 175 and go up depending on the size of your artwork and also the type of frame. For solitary orders, they usually deliver within 24 hours but do give them a call before you drop by. They also usually stock up on local art works and you can choose from various landscape renditions to serene Buddhas. You can also choose from a collection of mirrors here.